A threat actor has been targeting business and industrial control networks at electric utilities in the United States and United Kingdom, according to industrial cybersecurity firm Dragos. The group, tracked as “Allanite,” has been linked to campaigns conducted by Dragonfly (aka Energetic Bear and Crouching Yeti) and Dymalloy, which Dragos discovered while analyzing Dragonfly attacks. According to Dragos, a report published by the DHS in October 2017 combined Dragonfly attacks with Allanite activity. The company also noted that Allanite’s operations closely resemble the Dragonfly-linked Palmetto Fusion campaign described by the DHS in July 2017. However, while their targets and techniques are similar, Dragos believes Allanite is different from Dragonfly and Dymalloy. Allanite leverages phishing and watering hole attacks to gain access to targeted networks. The group does not use any malware and instead relies on legitimate tools often available in Windows, Dragos says. 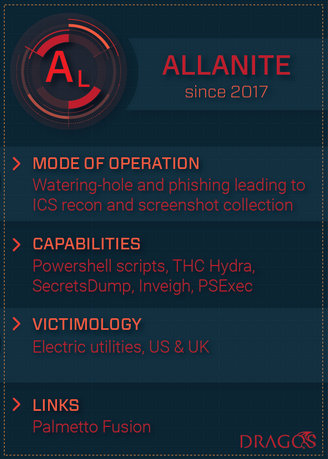 In July 2017, US officials told the press that the hackers had not gained access to operational networks, but Dragos confirmed third-party reports that Allanite did in fact harvest information directly from ICS networks. Allanite has been active since at least May 2017 and continues to conduct campaigns. Its operations target both business and ICS networks at electric utilities in the US and UK in an effort to conduct reconnaissance and collect intelligence. Dragos believes with moderate confidence that the threat actor gains access to industrial systems in an effort to obtain information needed to develop disruptive capabilities and be ready in case it decides to cause damage. However, the security firm says the group has yet to actually cause any disruption or damage. Dragos’ report on Allanite is the first in a series focusing on threat groups targeting critical infrastructure. Information on each actor will be made available through an Activity Groups dashboard, with full technical details made available to paying customers.